Whether you're jotting down memories of your last adventure, or planning your next one, the Harry Potter 3D Lenticular Notebook is perfect for you! The fantastic lenticular cover design is based on Harry Potter's wanted poster as created by the Ministry of Magic. 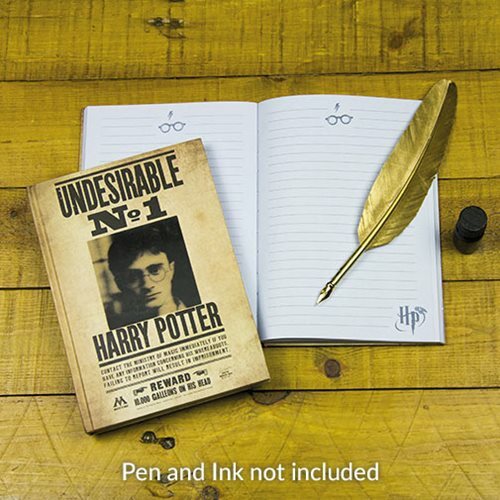 It features a mug shot of Harry and the phrase "Undesirable No1" at the top. The lenticular design allows the image of Harry to move when looked at from different angles in the same way the pictures move in the Harry Potter films. This hardback notebook has 200 lined pages, and is a great gift for the organized Harry Potter fan.